Deadly violence from a white supremacist rally in Charlottesville, Va., shook the nation in 2017. Since then, city leaders have struggled to define what public discourse should look like as once-marginalized voices increase demands for change. Charlottesville city government was upended after a woman was killed and others injured in a car attack by a white supremacist in 2017. White nationalists had targeted Charlottesville for a "Unite The Right Rally" after the Virginia town decided to take down a Confederate statue, part of its reckoning with a fraught racial history. Local authorities faced harsh criticism for not preventing the bloodshed. Within a year, the city's police chief, manager, attorney and spokesperson were all gone. And City Council chambers became the venue for angry and hurt residents to demand accountability. As once-marginalized voices amp up calls for change, the council continues to wrestle with the question of just what public discourse should look like after the tragedy. "It's been brutal for people," says council member Mike Signer, who was mayor at the time. "One of the places to express that is in your city council." Signer struggled to maintain order as people in the gallery would shout down speakers and use other disruptive tactics including crinkling water bottles. "Like nothing I'd ever experienced," Signer says. "There has been a lot of very strong emotion expressed in our chambers by people who are deeply traumatized," Signer says. "How do you have that happen when you also need to do the public's business?" As mayor in 2017, Signer's answer was to enforce rules – the standard Robert's Rules of Order — and then some ground rules for how long people could speak and prohibitions on heckling, harassment or foul language. In other words, he sought to pursue civility. "I see civility just as an instrument to let people, with very strong opinions, very strong emotions, be in the same body to get things done," Signer says. "Civility is actually used to shut down discussion," counters Jalane Schmidt, a local organizer with Black Lives Matter. "It is often a way to 'tone police' the folks that don't have power and that don't speak in four-syllable words." Charlottesville has a reputation as a charming college town — home to the University of Virginia, and its founder, Founding Father Thomas Jefferson. After what locals now call "the summer of hate," Schmidt says it's time to rethink the Jefferson legacy and all it entails. A memorial for Heather Heyer at the downtown mall in Charlottesville, Va. Heyer was killed in 2017 during a white nationalist protest. "There is this phrase called the Virginia way," she says. "It is ... based on an old way of doing things during an era when only white men basically were in power." The pain and chaos after the events of 2017 have prompted reflection in a town where the politics are left of center. A prominent voice for change, community activist Nikuyah Walker, was elected to the City Council and her fellow councilors chose her as mayor in January of 2018. Walker is the first black woman to be mayor in Charlottesville, a city where African-Americans make up about one-fifth of nearly 50,000 residents. The council now has two black and three white members. "I don't have an issue with people expressing themselves," she said at her first council meeting, as a signal that proceedings would be more open under her leadership. Audience members snapped their fingers in approval. In stark contrast to the previous mayor, Walker has refused to use her gavel to enforce rules of civility, even as meetings stretch to six hours. "Even though meetings have been very civil in the past, the results of those meetings have been complete disasters for people's lives ... especially if you were black and low income," Walker said at an October council meeting. Council member Wes Bellamy says now there's a more inclusive definition of civil discourse. "I could have a conversation with you and because my vernacular is not the same, and because a topic makes me more emotional and I'm more passionate about it, it doesn't mean that I'm not being quote-unquote civil," says Bellamy. "It could just mean that when I was talking to you in a way that you may deem civil, you refused to listen to me. So now you're going to have to hear me by any means necessary." Community activist Rosia Parker is a frequent speaker at the Charlottesville City Council. "Y'all always looking crazy every time somebody say something," she told council members at a meeting in December. "The problem is Charlottesville local government is not taking accountability for their wrongness and their actions." She wants more police transparency, and has been an advocate for affordable housing, but feels as though her message just doesn't get through. She describes being "listened at" instead of being listened to. "We just want to heal. We want to heal from the inside out and not outside in and business as usual," Parker says. "So that makes us argue more and more." But the current climate is not conducive for progress, says resident Jim Hingeley, a former public defender who has earned the nickname "Mr. Civility." "For me, in a way, it was a badge of honor," he says. "But certainly the people who were using it meant it very negatively." At a council meeting in January 2018, Hingeley was shouted down as he tried to advocate for more order. He likened the council environment to mob rule. "Let's call it what it is — intimidation by an angry mob," he said at the time. Hingeley says his comments were misunderstood to mean that by advocating for civility, he was standing up for white supremacy, which he disavows. "What I mean by civility is that it's something that that reflects good citizenship and is orderly behavior," says Hingeley. "The disorder was getting in the way of the city trying to recover." But Jalane Schmidt with Black Lives Matter says orderly behavior has not really worked for all of Charlottesville's citizens. "They've been coming to some of these public meetings for years," Schmidt says. "And the powers that be ... nodded their head, and smiled very politely, and gaveled out the meeting, and then gentrified the town right out from underneath it. So there's your civility." The very concept of civility has been polarizing here, says Vice Mayor Heather Hill. She prefers to talk about restoring a sense of mutual respect, so that people aren't discouraged from participating. "The biggest fear I have for our local community is that this environment is now just inviting a small faction to come in and speak," Hill says. "It's going to continue to turn away others from sharing their voice." Signer, the former mayor, says the whole point of government is being able to deliberate and make decisions together. "When you replace that with showmanship and bullying, and at the very worst just basically 'might makes right,' " Signer says. "That really is dangerous to democracy." Council members are split on whether city business is being helped or hindered. Bellamy says it might take a little longer, but work is getting done. For instance, the council established a minority business development fund last month. But at the same meeting a woman was shamed by another speaker for raising issues about sidewalk access. Charlottesville's longest serving council member, Kathy Galvin, says she doesn't think the current environment is conducive to solving the city's chronic equity issues. "If we get to the point where we can't tolerate differences of opinion, then we create a chaotic situation and we don't govern," Galvin says. Others see it as democracy evolving. "It is a messy-seeming process," says Andrea Douglas, director of the Jefferson School African American Heritage Center in Charlottesville. "The reality of any movement that changes the course of black people's lives is not about civil discourse," Douglas says. "There is no movement in America that changes the course of American democracy, including the Revolution, that was about civil discourse." In recent months, things have calmed down at the Charlottesville City Council. But people are of different minds as to whether a new climate is taking root, or whether citizens here are simply exhausted by the hard work of reconciliation. City leaders in Charlottesville, Va., are struggling to define what public discourse should look like. In 2017, a white nationalist rally turned deadly. Charlottesville became a target for that rally after the city decided to remove a Confederate statue. 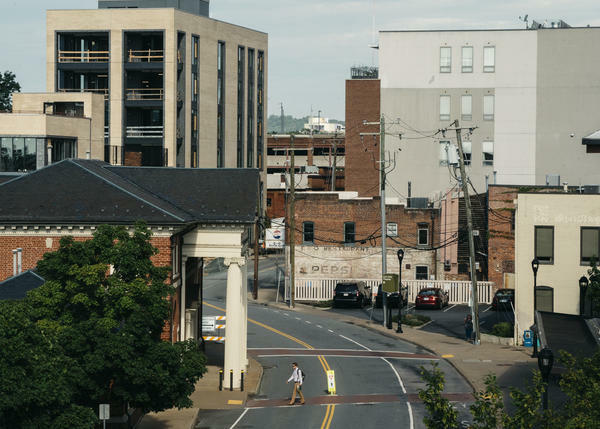 In the months since, the city has continued to reckon with its fraught racial past. As part of NPR's exploration of the meaning of civility, NPR's Debbie Elliott returned to Charlottesville. Here's what she found. 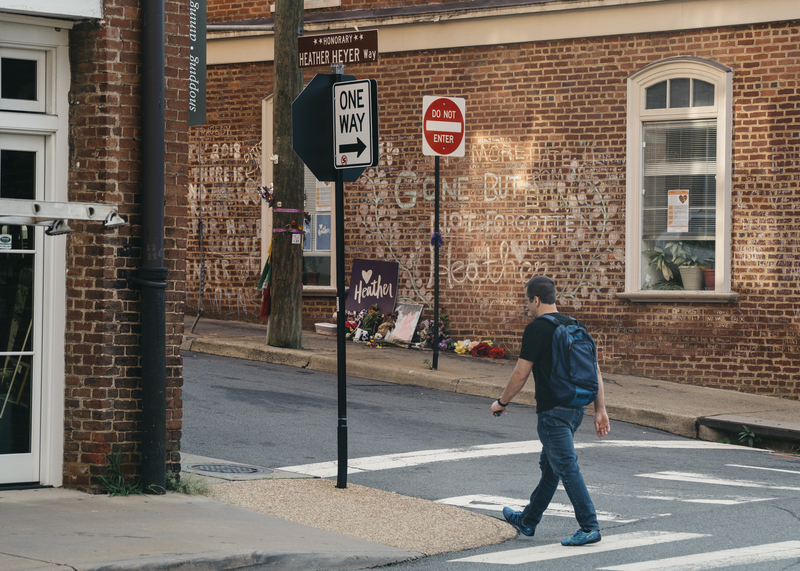 DEBBIE ELLIOTT, BYLINE: Charlottesville's city government was upended after a woman was killed and others injured in a car attack by a white supremacist in 2017. Local authorities faced harsh criticism for not preventing the bloodshed. Within a year, the city's police chief, manager, attorney and a spokesperson were all gone. And this is what it sounded like in city council chambers. MIKE SIGNER: All right. So we're going to suspend the meeting. ELLIOTT: Councilman Mike Signer was mayor at the time. Here, he struggles to keep order at the first council meeting after the tragedy. ELLIOTT: In the months to come, voices for change and accountability grew louder. SIGNER: There has been a lot of very strong emotion expressed in our chambers by people who were deeply traumatized. The question was just - how do you have that happen when you also need to do the public's business? ELLIOTT: As mayor in 2017, Signer's answer was to enforce rules - for instance, no heckling, harassment or foul language; in other words, pursue civility. SIGNER: I see civility just as an instrument to let people with very strong opinions, very strong emotions, be in the same body to get things done. JALANE SCHMIDT: Civility is used, actually, to shut down discussion. ELLIOTT: Jalane Schmidt is a local organizer with Black Lives Matter. SCHMIDT: It often is a way to tone police the folks that don't have power and that don't speak in four-syllable words. ELLIOTT: Charlottesville has a reputation as a charming college town, home to the University of Virginia and its founder - founding father Thomas Jefferson. After what locals now call the summer of hate, Schmidt says it's time to rethink that legacy. SCHMIDT: There is this phrase called the Virginia way, what I consider a false comity, that is based in an old way of doing things, you know, during an era when only white men, basically, were in power. ELLIOTT: The pain and chaos have prompted reflection in a town where the politics are left of center. A prominent voice for change, community activist Nikuyah Walker, was elected to city council. And her fellow councilors chose her as mayor in January of 2018. At that first meeting, she said proceedings would be more open. NIKUYAH WALKER: I don't have an issue with people expressing themselves. ELLIOTT: She's the first black woman to be mayor in a city where African-Americans are one-fifth of the population. Now the council has two black and three white members. In stark contrast to previous mayor, Mike Signer, Walker has refused to use her gavel to impose rules of civility, even as meetings stretched to six hours. Here's what she said after a council debate on the matter well into her term. WALKER: Even though meetings have been very civil in the past, the results of those meetings have been complete disasters for people lives in the area, especially if you were black and low income. ELLIOTT: Councilman Wes Bellamy says now there's a more inclusive definition of civil discourse. WES BELLAMY: I could have a conversation with you and because my vernacular is not the same and because a topic makes me more emotional and I'm more passionate about it, it doesn't mean that I'm not being, quote-unquote, "civil." It could just mean that when I was talking to you in a way that you may deem civil, you refuse to listen to me. So now you're going to have to hear me by any means necessary. ELLIOTT: Community activist Rosia Parker is a frequent speaker at Charlottesville City Council. PARKER: Like, I've come out of my character these last - you know, this last year and a half, and that's not me. ELLIOTT: Parker says on topics like police transparency and affordable housing, she feels like she's being listened at instead of being listened to. PARKER: So that makes us argue more and more. SIGNER: Let him finish, please. HINGELEY: Let's call it what it is. It's intimidation by an angry mob. ELLIOTT: Jim Hingeley is a former public defender who's earned the nickname Mr. Civility for his repeated calls for order. HINGELEY: What I mean by civility is something that reflects good citizenship and is orderly behavior. ELLIOTT: But Jalane Schmidt, with Black Lives Matter, says orderly behavior hasn't worked for all of Charlottesville's citizens. SCHMIDT: They've been coming to some of these public meetings for years, you know, and signing up, you know, dutifully to speak. And the powers that be, you know, nodded their head and smiled, you know, very politely and gaveled out the meeting and then gentrified the town right out from underneath us. So there's your civility. ELLIOTT: Council members are split on whether city business is being hindered. Councilman Wes Bellamy says it might take a little longer, but important work is getting done. Others, including Councilor Heather Hill, say legitimate views are getting drowned out. HEATHER HILL: The biggest fear I have for our local community is that this environment is now just inviting a small faction to come and speak in that way, and that's going to continue to turn away others from sharing their voice. ELLIOTT: Charlottesville's longest-serving council member, Kathy Galvin, agrees. KATHY GALVIN: And if we get to the point where we can't tolerate differences of opinion, then we create a chaotic situation. And we don't govern. ANDREA DOUGLAS: It is a messy-seeming process. ELLIOTT: The messiness of democracy evolving, says Andrea Douglas, director of the Jefferson School African-American Heritage Center in Charlottesville. DOUGLAS: And the reality of any movement that changes the course of black people's lives is not about civil discourse, right? There is no movement in America that changes the course of American democracy, including the revolution, that was about civil discourse. ELLIOTT: Things have calmed down at Charlottesville City Council in recent months, but people are of different minds as to whether a new climate is taking root or citizens here are simply exhausted by the hard work of reconciliation. Debbie Elliott, NPR News, Charlottesville, Va. Transcript provided by NPR, Copyright NPR.